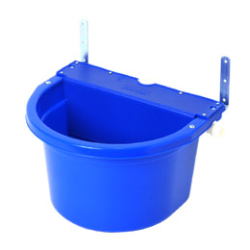 Large capacity 16 quart waterer is perfect for horses. Includes metal brackets for over-the-fence or on-the-wall installation. Molded from impact-resistant polyethylene resin. Hooks up to ¾ inch garden male hose. Operates between 10 to 70 PSI.